Wow, let’s go down memory lane. I started writing this post way back in September and never got around to finishing it. Now I have to take a break from photo editing and what better to do than to catch up on my writing. OK, I don’t want to bore you with my coastal explorations. This last trip is short. 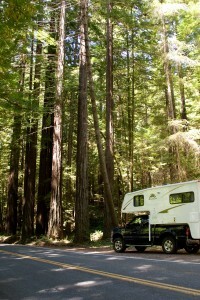 Having spent two nights in San Francisco without water, electric and sewer hook-ups made me more agreeable to staying at a campground without any hook-ups. In San Francisco I actually ran out of water. Fortunately, Priscilla had a garden hose at the front of her house and I could fill my tank. This would be the first and only trip along the coast with the camper on “my back”. I was hoping for overcast weather so that I would not regret it when I couldn’t stop to take a picture. I didn’t intend to make it too far that day, only up to Westport, north of Fort Bragg and only 100 miles from my current spot in Cloverdale. Highway 128 out of Cloverdale was very windy in the beginning, some mean hairpin turns. You just have to go really slowly, keep your fingers crossed and close your eyes. I am just kidding about closing your eyes. The weather stayed nice until I got closer to the ocean and then the fog just started to appear. I had my overcast day as wished. First stop, Mendocino. Cute little place shrouded in fog. After walking around for a while I found a local place for lunch, a decent tuna melt, and off I went again. But not before I bought some of my hard to find cereal at the local market. Wish I had bought more since I could not find any ‘til I got up to Washington State where I still had to search for it. 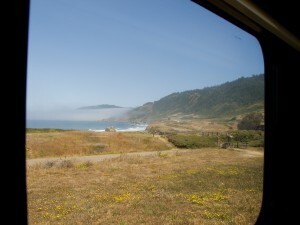 As I hinted in my last post (back in September Jicky’s trip to the coast, part 2 – The Sea Ranch to Bodega Bay), driving with a camper along highway one is not really fun. I found myself pulling over more often than I liked to, to let others pass. I hate to see a line of cars behind me. Unfortunately, pull outs are not always there when you need them. The road is just too narrow, windy, and for my taste sometimes a little steep to get up to speed. You have to understand that it can take me several minutes just to get back to the speed limit after I pull over and then there usually is a red light and I have to stop again. I just can’t win. The only other stop I made was in Fort Bragg to get some gas. 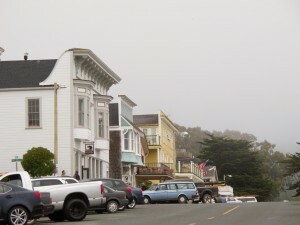 Compared to the other coastal towns I had seen this was more of a working class neighborhood. No fancy condos near the water. In any case I made it to the Westport-Union Landing State Park in the early afternoon. The campsite was just fifty yards from highway one. Fortunately, nobody travels on that highway after dark and it was super quiet. 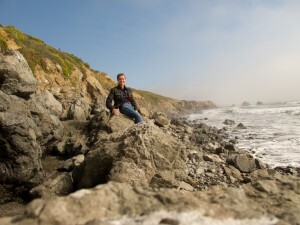 The really cool thing was that I also was just fifty yards from the Pacific Ocean. So my night music was the sound of waves crushing against the rocks and cliffs. There were not too many people in my section of the campground, only some families with their kids. I couldn’t believe the kids were running around in the swimsuits; it was freezing cold only about 50 F. I was told they came from inland California to cool off. Remember this was early August and it was hot about ten miles east from the coast. The sun was still out and the fog almost gone when I arrived. I made my way down to the water walking along the beach and climbing over rocks. It was just beautiful. That was the last time I saw the sun. The next day the fog was back, I think I saw the sun for maybe five minutes during the entire day. Despite the lack of sun I went on another excursion along the beach. I stumbled across a road that had partially fallen into the ocean; might have been a scenic byway. Nope, I asked the ranger later and she told me that that used to be highway one just a couple of years back. 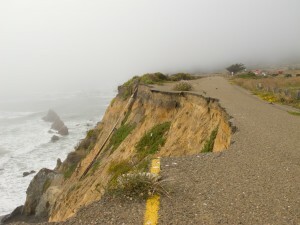 A big storm had eroded the cliffs and washed the highway into the ocean. Now the road is a several hundred feet further inland, for now. She also mentioned that this had been a miserable, cold summer with very little sunshine. Good thing that I didn’t have to stick around. After another night I moved on. My next destination was Del Loma in the Trinity Alps. 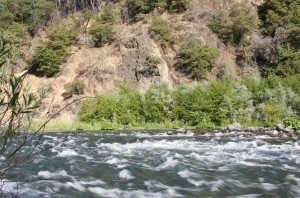 About seventy miles east of Eureka on the Trinity River. I remember listening to NPR on my drive up to Eureka. They were talking about the heat wave that had hit the east and center of the country. People called-in making suggestions how to stay cool. In the mean time I was sitting in my truck wearing a wool sweater and asking myself “What heat wave, it’s freezing out here.” It’s a big country with all sorts of weather. I was just happy when I turned away from the coast and finally got to see the sun again. 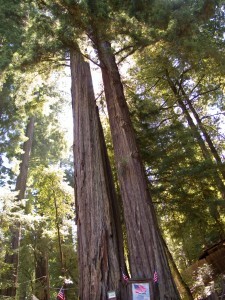 I drove through some impressive redwood forests. You don’t realize how huge these trees are until you see a stick of a pine tree standing next to one of the giants. I arrived at my campground in the woods early enough to pull out my shorts and defrost. The location was stunning. As I said, right by the river, surrounded by mountains. The river was not very deep but had a pretty good current. It was just great to go for a swim to cool off and be not disturbed by anyone. You just had to keep an eye out for bears. The day I arrived I was sitting by the river with a couple and their dog when all of the sudden the dog perked up. We followed his gaze and saw a bear just up on the mountain on the other side of the river; time to go back to the campground. We got binoculars and watched from the safety of the campground. Two more young bears appeared on the mountainside, but they didn’t cross the river; at least not while we were watching. The next morning I found bear poop on our side. Just have to remember who was here first. Blackberries were in season and they were in abundance on our river side. I wasn’t the only one who enjoyed picking and eating them. The bear poop was evidence. Even though there are other towns marked on the map near Del Loma, there really are no other towns, just a couple of buildings. The campground has a small store with some basics, but the nearest supermarket is thirty miles east in Wheaverville. Fortunately, there is a small café/restaurant less than ten miles to the east; one of those unexpected gems in the middle of seemingly nowhere. “The Strawhouse” not only has it the nicest owners, Julia and Don, but also a great menu. Grilled veggie sandwiches and other non meat items to die for. 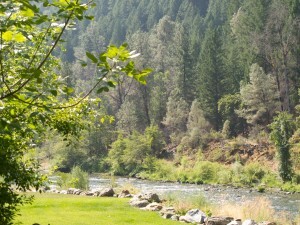 From their terrace you have a wonderful view onto the river, it is just so peaceful. 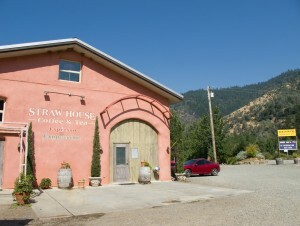 So, if you should ever find yourself on route 299 in northern California between Eureka and Weaverville, stop at the Strawhouse for a cup of coffee or stay over night. FYI, the building is build out of straw. www.strawhouseresorts.com This is a great area for white water rafting. In case you wonder what you could do out there. OK, let’s go back to photo editing. Enjoy the cool weather now, you might be complaining about the next heat wave soon.